Shekhar Kapur (born 6 December 1945) is an Indian film director, actor and producer known for his works in Hindi cinema and part of the Anand family. Kapur became known in Bollywood with his recurring role in the TV series Khandan in the mid-1980s and his directorial debut in the cult Bollywood film Masoom in 1983, which won the Filmfare Critics Award for Best Movie for that year. He gained international recognition with the 1994 Bollywood film Bandit Queen based on the life of infamous Indian bandit and politician Phoolan Devi, which won the National Film Award for Best Feature Film in Hindi, Filmfare Critics Award for Best Movie and Best Direction for that year. It was premiered in the Directors Fortnight section of the 1994 Cannes Film Festival and was screened at the Edinburgh Film Festival. His historical biopics on Queen Elizabeth (Elizabeth (1998) and The Golden Age (2007)) won the BAFTA Award for Best Film and two Academy Awards. He has been the recipient of the Indian National Film Award, the BAFTA Award, the National Board of Review Award, and three Filmfare Awards. In 2010, he served as one of the Jury Members (International Competition) at the 63rd Cannes Film Festival. Shekhar Kapur was born in Lahore, Punjab, British India to Kulbhushan Kapur, a doctor with a flourishing practice, and his wife Sheel Kanta Kapur. The nephew of famous Indian actor Dev Anand, he was discouraged from getting into films by his father. Sheel Kanta was the sister of actors Chetan Anand, Dev Anand and Vijay Anand. Shekhar is the only son of his parents and he has three sisters. One of his sisters, Neelu, was the first wife of actor Navin Nischol, while another sister, Aruna, is the wife of actor Parikshit Sahni. His third and youngest sister is Sohaila Kapur. Kapur's schooling was at Modern School, New Delhi. He studied economics at St. Stephen's College. At 22, Kapur became a Chartered Accountant with the ICAEW in England, having studied accountancy at the behest of his parents. Shekhar Kapur started his career working with a multinational oil company. He moved to United Kingdom in 1970, and spent several years working as an accountant and management consultant. He was married to Medha Gujral, niece of former Indian Prime Minister I. K. Gujral. They split in 1994. Medha later married popular bhajan singer Anup Jalota (she was his third wife). She died on November 25, 2014 at a hospital in New York City of liver failure following a second heart and first kidney transplant. Kapur then married Suchitra Krishnamoorthi, an Indian actress, writer, painter and singer in 1997. They are divorced. They have a daughter named Kaveri Kapur. Shekhar Kapur started his career as an actor in the movie Jaan Hazir Hai (1975) and later in Toote Khilone, in Bollywood. He appeared in several Hindi television dramas, like Udaan (Doordarshan) opposite Kavita Chaudhary, Upanyaas (Doordarshan) opposite Nisha Singh, and Masoom opposite Neena Gupta. He turned director with the family drama Masoom (1983) starring Naseeruddin Shah, Shabana Azmi and a young Jugal Hansraj. The plot followed the story of an illegitimate boy who struggles to find acceptance from his stepmother. He then directed the 1987 science-fiction film Mr. India starring Anil Kapoor, Sridevi and Amrish Puri in his most famous role as the villain Mogambo. Puri's most famous dialogue in this film "Mogambo Khush Hua" is still remembered. In 1994 he directed the critically acclaimed Bandit Queen and played a cameo in the film as a truck driver. Kapur was involved in the production of several Bollywood films before he abandoned them. He was originally the director of 1989's Joshilaay, which starred Sunny Deol, Anil Kapoor, Sridevi and Meenakshi Sheshadri before leaving the production halfway and its producer stepped in to complete the film. In 1991 he had shot some scenes for Barsaat which was originally titled Champion and was going to be the debut film of Bobby Deol but left the production and was replaced by Rajkumar Santoshi. In 1992 he was set to direct another science-fiction film titled Time Machine, which was to star Aamir Khan, Raveena Tandon, Naseeruddin Shah and Rekha, but abandoned the project halfway through due to financial problems. The film was left incomplete although there were talks many years later that Kapur would revive the project with a new cast which never happened. He partly directed Dushmani, starring Sunny Deol, Jackie Shroff and Manisha Koirala before its producer Bunty Soorma stepped in to complete the film. In an unusual role for him, Kapur provided the voice of Mohandas Gandhi in the Charkha audio books title of The Story of My Experiments with Truth, alongside Nandita Das as narrator. In 2013, Shekhar Kapur hosted the TV show Pradhanmantri on ABP News. On the show, which aims to bring never-seen-before facets of Indian history, he was the narrator. He served as judge on a reality TV series, India's Got Talent, aired on Colors. In 2016 Shekhar Kapur delivers an autobiographical film and documentary about Amma well known as Mata Amritanandamayi Devi called "The Science of Compassion". In 1998, he received international recognition for the second time after Bandit Queen, when he directed the Academy Award-winning period film Elizabeth, a fictional account of the reign of British Queen Elizabeth I nominated for seven Oscars. The 2007 sequel, Elizabeth: The Golden Age, was nominated for two Oscars. He was accused of being anti-British by British tabloids for his portrayal of the British Army and the Empire in the 2002 movie The Four Feathers. However, he denied being anti-British and stated that he was merely "anti-colonisation". Kapur was the executive producer of the film The Guru. He established an Indian film company with Ram Gopal Verma and Mani Ratnam, though the group has thus far produced only one film, Dil Se.. (1998), starring Shahrukh Khan and Manisha Koirala. Kapur executive-produced the Bollywood-themed musical Bombay Dreams by Andrew Lloyd Webber, which has been running in London's the West End since 2002 and on Broadway in New York City since 2004. In 2005, Kapur worked with Okan Quail on Hunji!, a story of a young Indian maid who idolised Sachin Tendulkar. Although it gained some acclaim as one of his finest films, critics across the UK and India called it a flop. In 2006, Kapur formed Liquid Comics and Virgin Animation, an entertainment company focused on creating new stories and characters for a global audience. The Shakti titles of Kapur and Deepak Chopra's company debuted with Devi and The Sadhu. Devi is about "a fierce feminine warrior, stronger than the Gods themselves ... a champion of the heavens, and the protector of man", while The Sadhu is about one man's choice between his spiritual oath and his human instinct." He was a member of the jury at the 2010 Cannes Film Festival in May 2010. Kapur's future projects include Long Walk to Freedom and The Last Full Measure. A third episode in the Queen Elizabeth series, Elizabeth: The Dark Age, is planned. According to screenwriter John Rogers, the success of Elizabeth led to Kapur being tapped to work on an adaptation of Isaac Asimov's Foundation Trilogy, but the project was eventually shelved. Kapur tentatively planned to helm a motion picture account of the life of the Buddha, titled Buddha, but the plans were dropped for unstated reasons. He planned to adapt Larklight, a book by Philip Reeve. Kapur traveled to Yerevan, Armenia to explore the possibility of making a film about the Armenian Genocide. In an interview with Associated Content, Kapur announced he is no longer attached to Larklight. He is set to direct Paani. The film is reported to star Sushant Singh Rajput and will be produced by Aditya Chopra. Its music will be composed by A. R. Rahman. The announcement was made at the 63rd Cannes Film Festival in 2010. One of his shelved projects was a film tentatively titled The Nine o'Clock War, which he had planned with his longtime friend and previous collaborator, the Australian actor Heath Ledger in the role of a popular television news anchor. It never happened, as a result of the actor's unexpected death in 2008. Kapur is set to write and direct a series titled Cleopatra about the famous queen Cleopatra of ancient Egypt, being developed by David Ellender's Slingshot Global Media. 1 2 "Shekhar Kapur: A life in focus". The Times of India. 16 March 2003. Retrieved 8 August 2011. ↑ "John Travolta likely to star in Shekhar Kapoor's Paani". The Hindu. Press Trust of India. ↑ "Shekhar Kapur: My uncle Dev Anand, the man no one knew...". NDTVMovies.com. ↑ "Anurag Kashyap: 'The perception of India cinema is changing'". Digital Spy. 1 2 "Shekhar Kapur, exclusive interview". Festival de Cannes. ↑ Ellison, Michael (18 March 1999). "Bard battles for Oscars against Private Ryan". The Guardian. London. ↑ "'Harry Potter' Star Emma Watson to Make Bollywood Debut with Shekhar Kapur's 'Paani'?". International Business Times. 14 May 2014. ↑ "Shekhar Kapur". The New York Times. Retrieved 8 August 2011. ↑ "Shekhar Kapur becomes a name to reckon with in Western cinema". The Indian Express. 16 March 2000. Retrieved 8 August 2011. ↑ Wild, Damian (5 October 2003). "Shehkar Kapur: Reeling in the punters.". Accountancy Age. Retrieved 5 May 2013. ↑ Kapoor, Shekhar. "My uncle Dev Anand, the man no one knew…". Retrieved 5 May 2013. ↑ "Sorry". The Indian Express. India. Retrieved 8 August 2011. ↑ Bhawana Somaaya (6 December 2002). "Screen > The Business of Entertainment". Screenindia.com. Retrieved 8 August 2011. ↑ "Doordarshan running out of programmes". Retrieved 2016-06-23. ↑ Koimoi.com Team (22 June 2010). "A Tribute To Amrish 'Mogambo' Puri". Koimoi.com. Retrieved 3 March 2014. ↑ Roy, Amit (26 July 2001). "The dacoit leader who wore a tiger skin sari". The Daily Telegraph. London. ↑ "Time Machine Rushes – Aamir Khan, Raveena Tandon, Rekha, Naseeruddin Shah, Shekhar Kapur". YouTube. Retrieved 3 March 2014. ↑ Vajir Singh (1 February 2008). "Shekhar Kapur to revive Time Machine". Hindustan Times. Retrieved 3 March 2014. ↑ "Shekhar Kapur moves out after Bandit Queen". filmnirvana.com. Retrieved 8 August 2011. ↑ "Pradhanmantri". abpnews.in. 13 July 2013. Retrieved 8 August 2011. ↑ "The Science of Compassion (Video available on YouTube)". Shekhar Kapur. 26 April 2016. Retrieved 2 May 2016. ↑ Rajat Ghai (2 November 2012). "Shekhar Kapur: "Film on Armenian genocide will be challenging"". Hetq. Retrieved 3 March 2014. 1 2 How Deepak Chopra's Virgin Comics is changing comic book industry. ↑ "Kung Fu Monkey: Futurism vs. Futuruisn't". Kfmonkey.blogspot.com. 17 July 2007. Retrieved 8 August 2011. ↑ "Rahman scores of Paani". Behindwoods. 11 October 2010. ↑ John (16 May 2010). "Shekhar Kapoor Hires A R Rahman for Paani". Taking Films. ↑ "Paani in Cannes". Sworovski. 15 May 2010. ↑ Petski, Denise (18 August 2015). "'Cleopatra' Series In The Works At Slingshot Global Media". deadline.com. Retrieved 19 August 2015. ↑ "National Board of Review of Motion Pictures :: Awards". Nbrmp.org. Retrieved 8 August 2011. ↑ "Alia to be paired with Sushant". post.jagran.com. 7 August 2014. 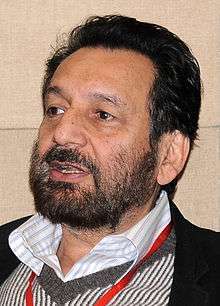 Wikimedia Commons has media related to Shekhar Kapur.